Posted February 25th, 2016 by The Antique Register & filed under Exploring Arizona. The Town of Wickenburg is an easy 45-minute drive from our North Phoenix office so my sister Phyllis and I decided it was time to take a fun break and check out Arizona’s most western community. 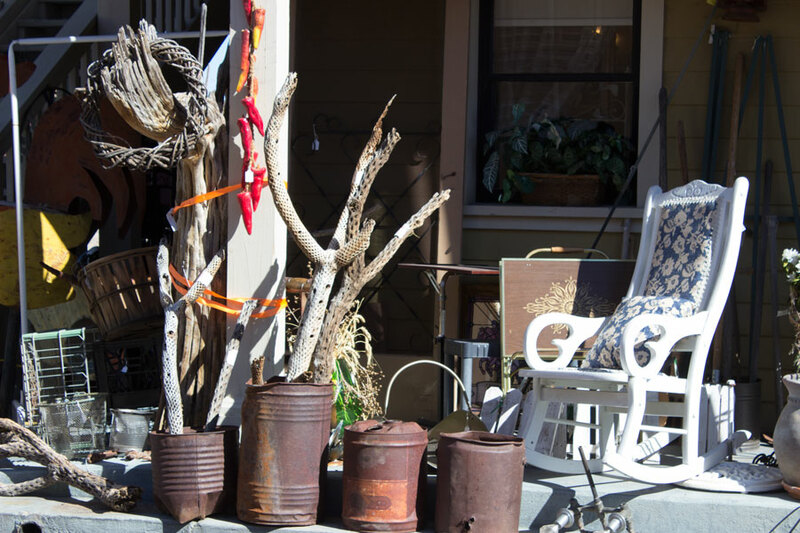 We especially wanted to visit two of our advertising shops—Wickenburg Antiques & Artisans and Sandi’s Boutique—and explore other parts of this community that is committed to preserving the best traditions of the Wild West. We enjoyed our drive through the beautiful scenic Sonoran Desert along with our lively conversation. 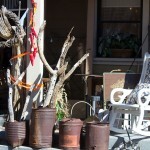 Our first stop was at Wickenburg Antiques & Artisans at the entrance to Historic Downtown on Wickenburg Way. Located in the restored Texas Hotel that was originally built in the late 1880s, the mall is home to more than 60 dealers. Visitors will find lots of offerings, including: antiques, collectibles, cowboy, native crafts, vintage, jewelry, home décor, furniture, clothing, gifts and art as well as homemade cookies, candy and jelly. Owner Beth Gallant opened the mall on September 1, 2010, and the business has grown to fill two stories with over 3500 feet of space. 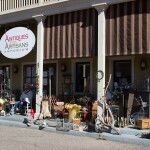 Part of the appeal of Wickenburg Antiques & Artisans is its unique historic building. Since the original owners were from Texas, it was called The Texas Hotel when Wickenburg was a stagecoach stop. Over the years, it has been used for many purposes and, at one time, was the Texas Cafe and Bar. There are also stories of a ghost or two roaming around the building. Just ask Beth or one of the dealers to share their experiences. From age six, Beth grew up in Wickenburg, graduating from WHS and earning a degree in Journalism from Northern Arizona University. She worked in Phoenix until moving back to the town she loves more than 19 years ago with her husband and daughter. 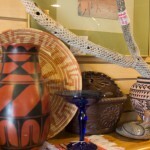 Wickenburg Antiques & Artisans is at 278 E. Wickenburg Way and is open seven days a week from 10 a.m. to 5 p.m. Rental spaces are available from a small space to a whole room and Consignors are welcome. For more information, call 928-231-9263, email wickenburgantiques@gmail.com or visit Wickenburg Antiques & Artisans on Facebook. 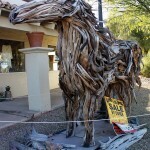 In front of Sandi’s Boutique is an amazing life-sized red cedar driftwood horse created by a local artist that is a preview of the unique artistry you’ll find in this shop. A park bench under a desert tree nearby looked peacefully inviting but we resisted the temptation to sit a spell since we were interested in checking out the shop. We were greeted by Owner Sandi Taylor and her ‘assistants’—mom Kathy Goodwin and sister Sheri Kunce. Sandi took us on a tour of the shop and we were amazed at the variety of artwork from the 25 local artists. We moved from display to display and enjoyed seeing items such as: handcrafted leather ware, jewelry, red cedar driftwood sculptures, western and home décor and furniture There were also Cholla and Saguaro cactus items made into candle holders, napkin holders, plant stands and more. Sandi showed us a collection of fossils that had a large palm fossil from Wyoming, a mammoth tooth and Megadon shark teeth. The shop also carries women’s clothing and gift items. Arizona Cocker rescue has a space for many pet items and the proceeds help pay for medical care, spaying, neutering and fostering rescue dogs of all breeds until they find forever homes. Sandi’s Boutique’s many vendors are always creating and changing so you need to visit often to see what’s new. In the restaurant business for many years, Sandi owned Sandi’s Arrowhead Steakhouse in Congress before opening Congress Junction Mall also in Congress. In April 2015, she relocated to Wickenburg to open Sandi’s Boutique. Sandi’s Boutique is located at 360 N. Tegner Street at the corner of Frontier Street and there’s plenty of parking behind the shop. The shop is open Tuesday to Saturday from 9 a.m. to 5 p.m. and Sunday from 11 a.m. to 5 p.m. For more information, call 928-684-6817 or follow Sandi’s Boutique on Facebook. One of Sandi Taylor’s ongoing goals is to see all the Wickenburg businesses—along with her shop—become a destination for locals and visitors and she has worked with the other shop owners to support and promote their town. There are many locally owned restaurants, interesting businesses and appealing attractions to keep all visitors busy, whether it’s a day trip, a weekend visit or longer. We stopped in at Crissman’s Antiques and Flower Barn where owner Verne Crissman serves the Wickenburg area designing and delivering beautiful floral displays. 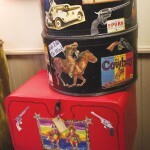 It’s an added plus to find antiques, vintage, collectibles and home décor all in one shop. Verne was busy preparing for Valentine’s Day weekend but made time to show us around the shop and share a little history of Wickenburg. Crissman’s is at 272 E. Wickenburg Way and is open 7 days a week. For information, call 928-684-0550. We checked out two other shops that were recommended by Sandi and Beth. Rusty Rooster at 186 N. Tegner Street was opened by Gerri Warren in October 2015. 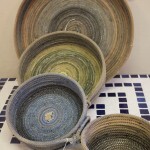 Here we found beautiful artwork from many local artists plus clothing, home décor and gifts. For information call 928-684-6884. Just down the street, next to the Wickenburg Museum store, is Mare Island Horse Trader at 28 N. Tegner Street. This shop had only been open for a week when we stopped by but owner Terese Arntson has been very busy setting things up. She has a number of vendors with space for a few more and offers antiques and more. For information, call 707-624-9788. Phyllis and I couldn’t believe that a day could pass so quickly. We got to enjoy a town steeped in western history plus experience the warm hospitality of small town shop owners. We’re looking forward to visiting Wickenburg again! There is so much to see and explore in Arizona and we are making plans for our next trip. Because we enjoy sharing our adventures, we’ll continue telling you about the great destination shops we visit—so be sure to watch for our articles in future issues of the paper.